One of the most important things you need to do when you start marketing a product or service to have a clear idea who exactly is your market. A well-crafted customer avatar will help give your team absolute clarity about the kind of customer you are going after. 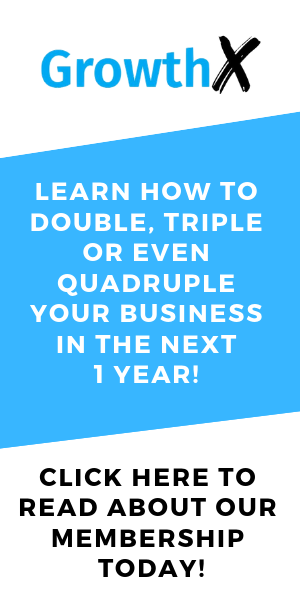 It will also give you a good idea how to target them and craft a marketing message that gets them to take action on your offer. In this blueprint, we’ll teach you how to put together an ideal customer avatar for your marketing and advertising. You can pass this ideal customer avatar to your current and new team members and they will have a clear idea who you’re marketing to. Narrowing down on the right type of customer that is a good fit for your product/service may be tricky. Especially when you tend to want to target as many people as people. You can download a PDF version of the blueprint and the resource here. You can jot down a couple of ideas as you read through each section. Then you can reference our example and connect your ideas together into a single customer avatar. Before we jump into how you can create your own customer avatar, here are some resources you can use as you go through the exercise. There are different types of customer avatars when it comes to marketing. And if you do a search online today, you’ll find multiple resources on how to create a good customer avatar. It’s easy to get overwhelmed by the amount of information you need to collect on your avatars, or how to even start to do it properly. Our recommendation is to find one that works for your business and add on other information you might need later on. Contrary to what most people think, there is really no hard and fast rule about what should be in the perfect customer avatar. 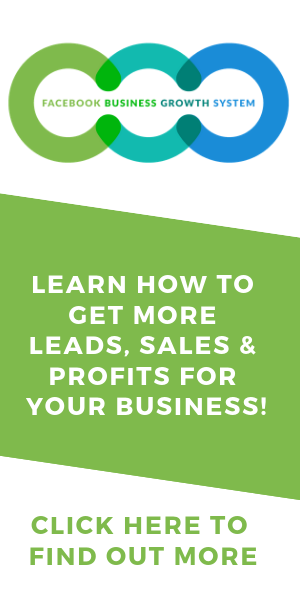 In this blueprint, we’ll teach you how to put together an ideal customer avatar specifically for paid traffic campaigns. Sure, you can make it a little fancy but for us, we prefer to create our customer avatar in Google docs so we can share it with the rest of the team. The fastest and easiest way to do this is to pick a customer avatar from your existing customer. It’s much easier to have a real life person you can reference. We recommend you have at least 3 – 5 customers as reference and look for similar characteristics and attributes that you can tap on. It will give you a more accurate view of your ideal customer avatar. Customers with high customer lifetime value (CLV) – meaning they’re likely to buy more and often in the near future. Having at least 3 buying cycles worth of data is recommended if you want to use this as a criteria. Customers who are more likely to order more in the front end. This means they have higher average order value. Customers who are influential – meaning they are likely to spread the word and refer their friends and family if they are happy with your product or service. Optional: Customers who are easiest to serve – It is always a plus if you can attract the type of customer that require less resources to serve and yet can get the most value from your product or service. If you are a new business, we recommend you look at your competitors and make an educated guess about who they are targeting. You can find out about this by checking out their website and look at the copy. Ask yourself who are they speaking to. 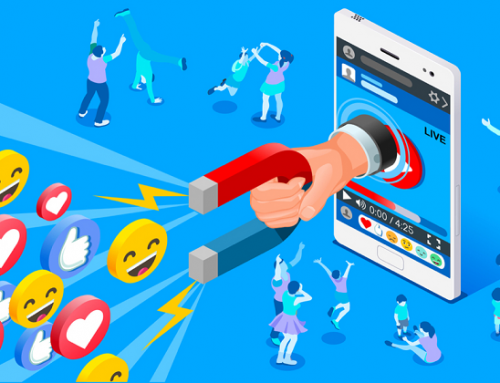 You can also check out their fan page to look at who are the fans following them and engaging with their posts, especially posts related to your product or service. 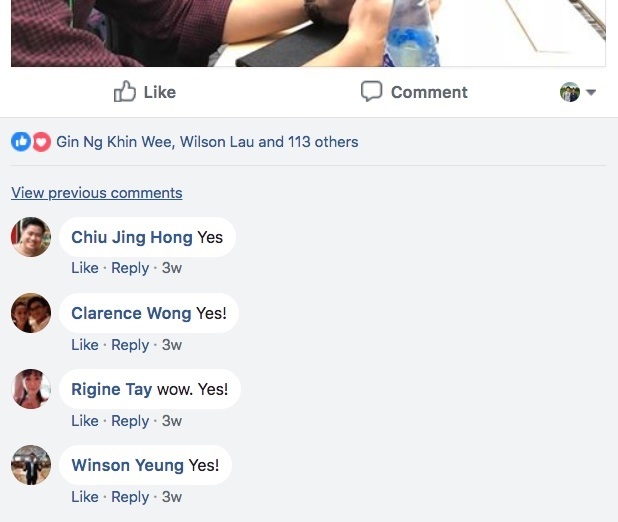 Here’s an example of a post where we asked our group members to comment to express their interest in our content. You can go into the fans’ personal Facebook profile to have an idea of who they are (their interest, hobbies, etc). There is a list of information you can use below: Try to fill up as many as possible. Note: It’s not important to fill up all the above information. 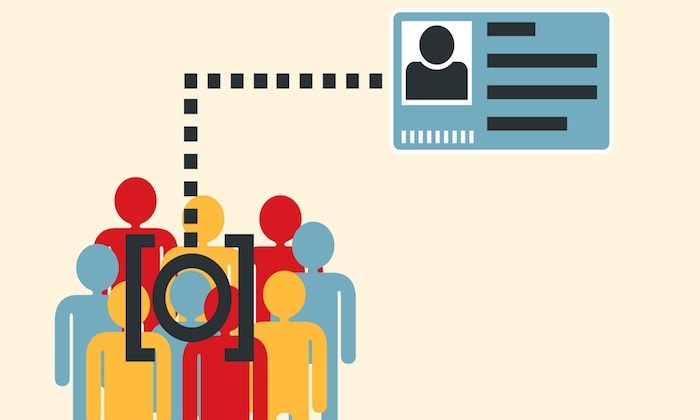 Focus on the important demographic information that might help you in your targeting later. 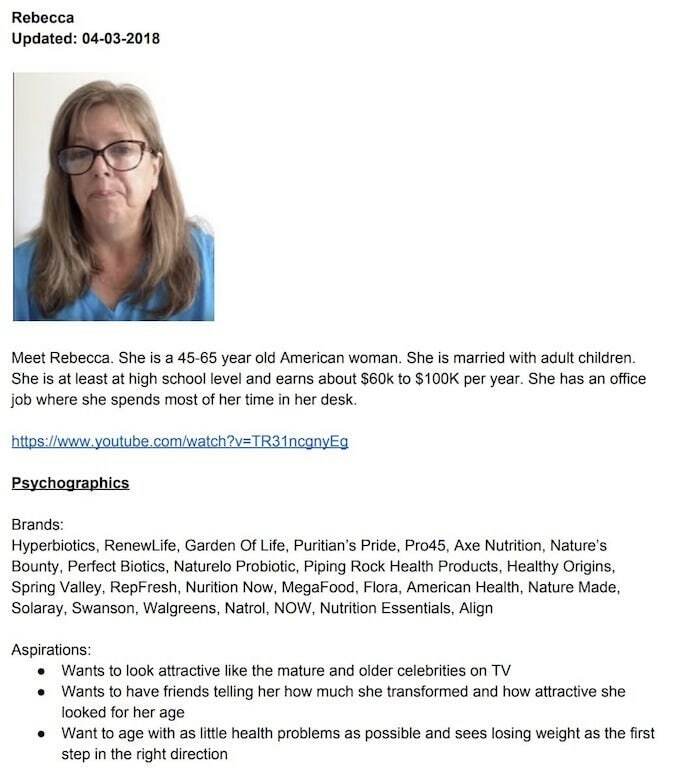 Rebecca is a 45-65 year old American woman. She is married with adult children. She is at least at high school level and earns about $60k to $100K per year. She has an office job where she spends most of her time in her desk. It’s important to understand what goes through the mind of the market we’re going after. 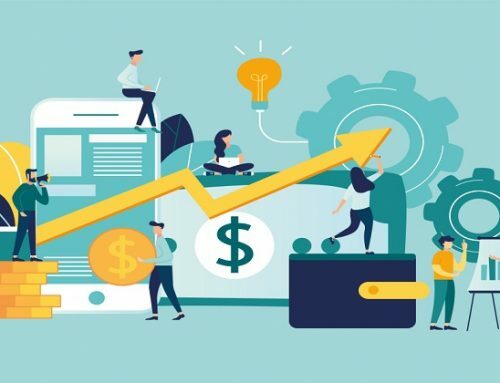 The more intimately you know your prospective customers, the easier it is for you to craft highly engaging marketing messages that they will respond to. What are the well-known brands they tend to follow or trust? You can include brands of competitors and alternatives here. You can also include brands that might not be related to your product or service, but might be serving the same market. This can be done quickly using Google Shopping. Go to Google.com and click on “Shopping” in the top navigation menu. You can sort by review score to pick the more popular products. You can also filter by price, type, ingredient, form. Amazon.com is also another great place to look for similar competing brands. 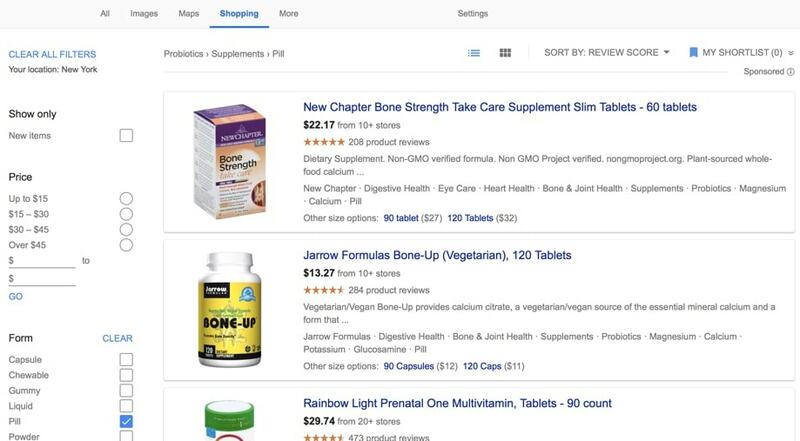 You can check out the top featured products in your market. Aspirations are defined as a hope or ambition for achieving something. It is usually longer term than a “want”. If you have been in the business for some time and interacted with your customers consistently, you’ll probably have a clear idea what your customers are looking for when they purchase your products and services. Ask yourself: If your ideal customer could have anything they want with a wave of a magic wand, what would they ask for? Hobbies are basically things they do in their free time. You can write as many as possible. 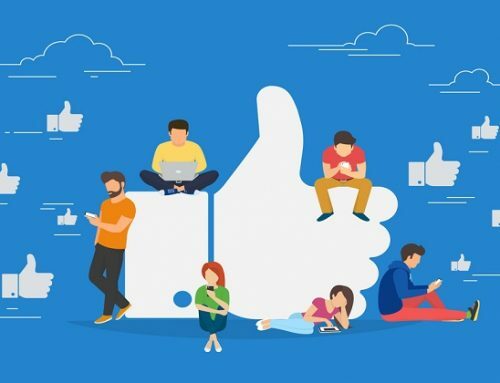 A quick Google search will be able to help you get you a list of hobbies you can target as interests when you start setting up your Facebook ads. Now, this is a chance to go a little deeper into your customer and what is important to them. The idea is to uncover these values and craft ads that are aligned with these values later. For example, if family is an important value for Rebecca (our customer avatar), we might talk about how one of the benefits of losing weight naturally using probiotics is to be able to have the energy and vitality to do enjoyable activities with your family. This is just an example of how the information in your customer avatar can be useful for creating your ads later. This part is extremely important. Like what Anthony Robbins, the world’s foremost authority in motivation once shared, “We are all driven by pain or pleasure.”. If you want your target market to respond to your ads, you need to talk about the pains they’re experiencing or the pleasure they are seeking through your solution. We call these goals and challenges. For goals, you need to write down exactly what your market wants to achieve through your solution. You can write down as many goals as possible that relates to your product or service. You can use these goals to come out with more ad angles that will help you write better ads. At the same time, what are the problems and challenges they are facing that doesn’t allow them to solve their problems? These could include worries, anxieties, frustrations and problems they are facing that are related to your product or service. Describe in detail (as much as possible) what are the possible pains and challenges they might be facing. These can be very useful in creating interest and desire in your solution. Now, some of you might be wondering why this is important. There are 2 reasons why advertisers might want to know more about the living environment. 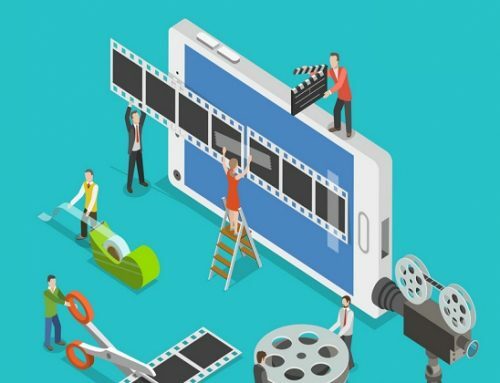 For one, it makes it easier for you to relate to to the audience by talking about the things they see, hear or experience on a day to day basis. In my ad, we could talk about a “lack of energy” as a pain point of not losing weight. But it probably wouldn’t trigger an emotional response from my target customer. Now, if we know that one of the day to day activities will be going to the nearby supermarket to buy something, we could describe the lack of energy with more detail. The 2nd reason is that it makes it easier for your team and yourself to relate to the target customer and see the world from their point of view. This helps you develop more empathy for the customer you’re targeting and improves the way you market and communicate with them. Take some time to describe their typical day. What do they do when they get up? Where do they usually go? What do they experience at work? Who are the people they interact with? What are some of the triggers that might cause them to think about their current pains? Now, let’s talk about how behaviours work. Instead of focusing on what’s going on in their mind, we want to focus on what they are doing. This makes it easier for us to find possible interests / keywords we can target later. The important thing is not to limit yourself to the list you’re given. You might find more categories of behaviours as you do your research. 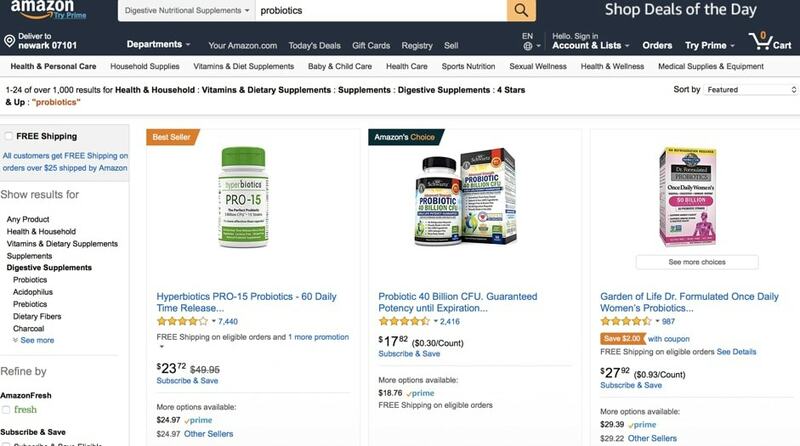 If you’re looking at products they purchased, you can check out Amazon.com and look at what other products customers are purchasing from your direct competitors. If you want to look at blog and websites, you can check out SimilarWeb (https://www.similarweb.com). You can research on websites of competitors that target the same audience and find out what other websites they visit. MIND, Weight Watchers, Flexitarian, Mediterranean, DASH, Keto, Volumetrics Diet, Jenny Craig Diet. At this point, you might observe a certain pattern in the exercise. We are essentially adding layers after layers to our customer avatar. It’s the same process that writers might take to develop their main characters e.g. adding a backstory, motivations and relationships. What kind of role does quotes and objections play in developing the customer avatar? For one, it allows you to actually “hear” what your customers might say or what is going through their minds when they are considering your product or service. This can be useful because you can address these in your ad copy. For example, if I know one of the their objection is “Can I trust this brand?”, we can address it by including credibility builders such as testimonials and endorsements in the ad or the landing page itself. It also allows you to pick up nuances in the way they speak. 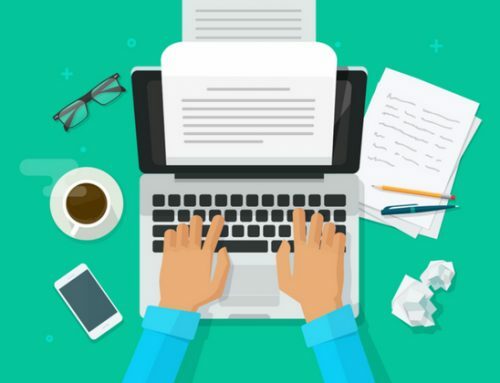 One of the proven ways to write compelling advertising copy is to write your ads is to use the same language and speech patterns as your target market. How do you do this exercise well? Recall the last few conversations you had with your target customers..
Write down word for word what you or your front end sales team have heard from your customer. You can also pick up quite a few quotes and objections from Facebook groups and forums like Quora (http://quora.com). Look at the questions they are asking and answers given by the members in the group or forums. 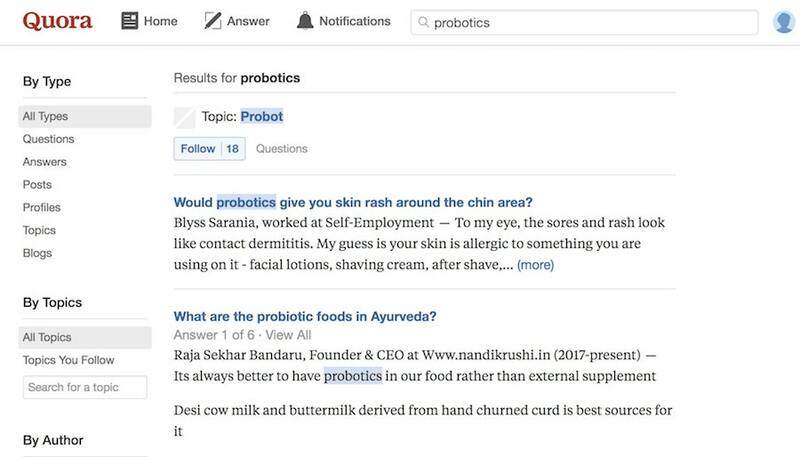 For example, if I’m selling probiotics and I do a search on Quora, I can see a list of possible questions your customers might ask about. If you have an online support ticket or chat, look through the past tickets and submissions and “copy and paste” the questions into your website. By now, you’ll have a few pages of information about your customer. Some of the information might be repetitive and some of it might not make any sense on your second review. There is no such things as a perfect ideal customer avatar. And chances are, you’ll always be refining the avatar every few months. You might want to verify the accuracy of your avatar by running through it with your team, especially those who interacted with your customers consistently. The short answer is “yes”. You can have as many customer avatars as possible for different customer segments. But if this is your first time doing customer avatars, we recommend you stick with one first. It will make it easier for you to pick up the basics of translating the customer avatar information into your advertising strategy and copy.